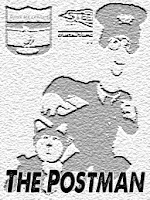 Read on for 'The Postman's' Four of the Best for Round 22 including our now weekly NRL Dream Team and NRL Super Coach 'PODM'. Though The Postman's brief stint at NRL.com is over - the popular 'Point of Difference Maker' (PODM) option introduced to the weekly DT Market Watch will remain available to DT/SC Tragics here on www.wdnicolson.com until the end of the regular season. Plus you get 16 extra NRL Dream Team and NRL Super Coach tips for your consideration in the Round 22 Tipping Preview. So here are 'The Postman's' Four of The Best TIPS for Round 22 including our now weekly DT and SC 'PODM'. 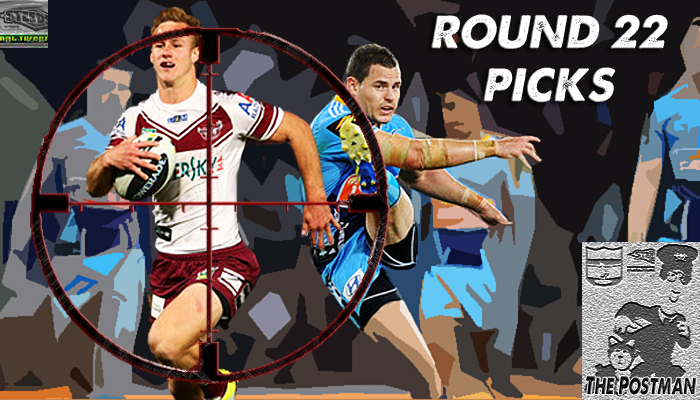 The Round 22 Tipping Preview is here with PLENTY of Latest of Late Mail. The Postman Says: He's now doing all the general play kicking with Albert Kelly injured - and that was a big DT strength of his in the first place. Kick metres are very handy reliable stats in DT - plus if the Titans are going to create any points - odds are it comes off his boot. While you should never rely on the laughable Try Assist statistic - his goals and kick metres are the bomb. Would like to see him run more sure and his tackle count isn't in the DCE/Reynolds range sadly. Still if you want to be different from most in the Halves - Sezer the day. Next 5 games: CBY, NQL, WAR, GLD and MEL. The Postman Says: Manly have towelled up some opponents recently but DCE only broke through for some form in two of the four wins (both against Parra - 95 in Rd17 and 104 in Rd21). He seems to have shaken an ankle problem from 2 weeks ago and his next five matchups are: WAR, SOU, CAN, MEL and PEN. DCE is a high involvement player who when he's on song - there's few who make more things happen in the game. Plus in addition to his playmaking he can backup and score a try... if you want a PODM in your SC halves - DCE is the acronym for you. Next 5 games: WAR, SOU, CAN, MEL and PEN. The Postman Says: He has always teased DT and SC managers... and The Postman admits he got tricked into riding the Mateo train one last time at the start of the season... but he was punted for SBW very quickly (who I had all pre-season only to inexplicably change my mind). When he's on - he's a 80-100 guy... but he's just been woeful the other 15 games he's played this season. If you brought him in as your own PODM - likely only in SC - get him out and get a reliable big scorer in... do whatever is necessary because you are risking an awful lot on him 'coming good' if he is your starter in the Finals. The Postman Says: While I admire your ability to be in the running for your Head to Head league if you still don't have CP13 - you will get burned without him in the Finals if you don't rectify the situation. Is back playing 80 minutes and is a must have as Brisbane try to stay in the playoff race - which is great news after a curious plan from his coach in the first six weeks that had him only playing 60-65 minutes a game. Since his game time has gone up he has just got better and better. Remains one of the best SC captaincy options (has SC scores above 80 in 12 of his last 13 games) but needs to be the goalkicker again if he's to ever threaten Cameron Smith as the standout week in week out DT captain again (despite DT scores of 60+ in 11 of his last 13 games). Next 5 games: STI, PAR, PEN, NEW and CBY. Have a DT or SC Question for Round 22? 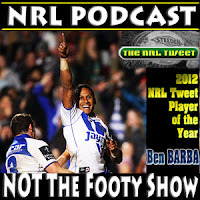 Who will take Ben Barba's mantle as champion in the 4th Annual @NRLTweet Player of the Year Awards? The Prestigious Award is closing in on naming a new champion in 2013.